His name is Georgoe. 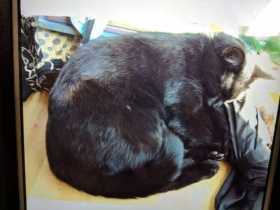 He is a domestic short hair black neutered male yellow eyes declawed in the front. Small white patch on chest couple white hairs on knee. He is microchipped.